Last week, we highlighted how we’re seeing Mortgage Brokers successfully implement referral programs with QuickLinkt. This week, we’re showing how auto dealers are increasing customer referrals and building loyalty. Car dealers are just one type business that have been quick to see the benefits of using QuickLinkt to drive referrals. Looking at the sales cycle, it’s no wonder they’re seeing success: buying a car is a big purchase decision, therefore customers seek advice from family & friends to find a trusted dealership and salesperson. Better yet, it’s a great time for dealers to take advantage of referrals since 2015 is set to have the highest car sales since 2005. We’re finding most dealerships use QuickLinkt to encourage, track & reward referrals from past customers. Typically, dealers are using two-sided incentives for their programs that allow past customers to share an offer – say $200 towards a vehicle purchase – with friends and family over social media, email or text. Then once the referred customer purchases a vehicle, the customer that shared the offer is rewarded back. The reward is usually a credit towards the dealer’s service department or a gift card. As well, dealers use QuickLinkt’s Specify Representative feature to allow customers to make a referral to a particular salesperson. This allows customers to send referrals directly to their trusted sales rep, and dealers to track performance. The great thing about having past customers share offers over social media is that the reach of referral campaigns is exponential – the average adult Facebook user has 338 friends, so a few shares a day means a dealership’s offer can quickly reach thousands of potential customers. This makes it easy for referral programs to have the large scale audience of advertising without the high price tag. The other great advantage of QuickLinkt for auto dealers is that it not only brings in new customers, but it also strengthens relationships with past customers. When dealers select to give a credit towards their service department, it encourages past customers to use the dealer’s service department instead of visiting a different mechanic. Better yet – since it connects customers with the dealership after the sale, they’ll be far more likely to return to the dealership when they’re ready for their next vehicle. At the end of the day, businesses can use QuickLinkt to create the referral program that’s right for them. Whether using QuickLinkt to to reward customers for sharing offers with friends, rewarding past clients for referrals or tracking B2B professional referrals, QuickLinkt creates automated referral programs that are customized to the business’s needs. 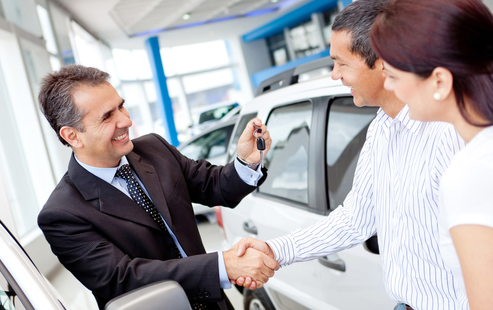 If you’re an auto dealer, how do you drive referrals? To learn more about QuickLinkt and get your Free 30-Day Pro Plan Trial, visit www.quicklinkt.com.